The Guts (Long Guts) is a non-directional Debit Strategy which involves buying an In The Money Call Option and an In The Money Put Option. The Guts has unlimited profit and defined risk which is limited to the debit required to purchase the two Long Options. This strategy benefits from Volatility and is profitable when the a move to the up or downside is significant enough to recoup the cost of the corresponding losing side. 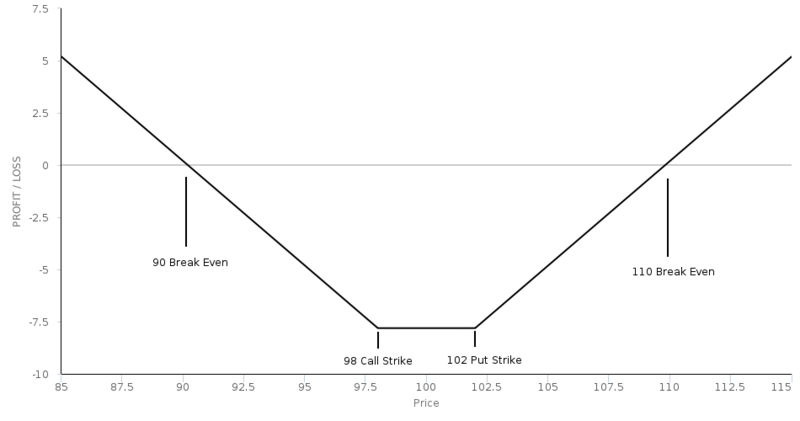 The Long Guts has similarities with the Straddle and Strangle, except In The Money Options are used, unlike those strategies that employ At The Money and Out Of The Money Options, respectively. Optiontradingpedia.com guide to Long Guts, includes some advice for managing Guts trades.